- Crib has the perforated flat platform. Complete SS tubular structure mounted on 100mm dia. castor wheels. Overall approximate size: 1100mm L x 640mm W x 1040mm HSlide down Railing. 50mm thick PU foam mattress with rexine cover. Finish: Matt Buffing, supplied in Assembled. 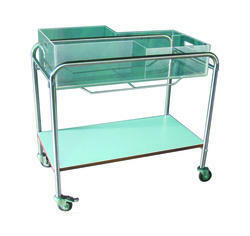 Backed by a team of adroit professionals, we are manufacturing an extensive array of Baby Trolley. Cot Sheet, Bassinet Sheet, Crib Flat Sheet, Crib Fitted Sheet, Crib Bumper, Crib Comforter, Pillow, Pillow Cover, Crib Set, etc. Tubular pipe framework. Removable swinging type cradle. Mounted on 100 mm diameter castor wheels, two with brakes. 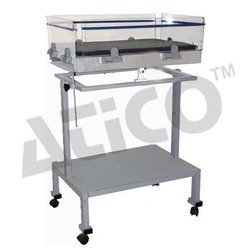 Dimensions (LXWXH) Cradle: 760 X380 X300 mm, Frame: 910X450X 980mm. Pre-treated & Epoxy powder coated finish. Strong tubular steel stand on four rubber stumps with handling bars mesh crib. Pre- treated , epoxy coated finish. Crib Size: 76 L × 42 W Cm. Height to crib top:103 cm. - Mounted on four castors 60mm. - Crib manufactured from Plexiglass. - Trendelenburg & Reverse Trendelenburg position. We are engaged in manufacturing and exporting a vast array of Baby Crib, which are fabricated using world-class raw materials and innovative technology methods. We have made the procurement of the materials from some genuine and reliable vendors of the industry. Facilitated with huge industrial expertise and understanding, we offer Baby Crib.